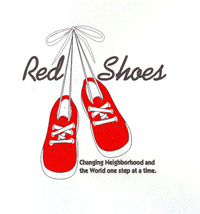 Become a part of our Red Shoes Prayer Walk Ministry! As we walk and pray through neighborhoods glorifying GOD! Wearing RedShoes, signifying walking in the blood, and White clothing signifying being cleansed by the blood. We will make a statement of who we are and whom we serve. As we are praying and walking through neighborhoods, people will ask us what we are doing. When we tell them we are praying for their neighborhood they will often ask us to pray for them also. This is how we can begin to minister to as well as evangelize our neighborhoods. Contact Us One very inportant point! All our conversation and our praying must be to glorify GOD! Secure Donation - ONLINE Watch what GOD will do as we join Him in what He's up to!! !